I read a fun fun book!! 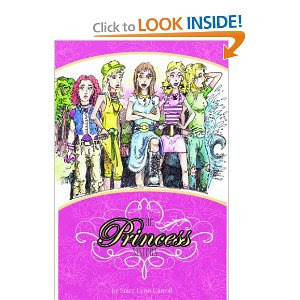 The Princess Sister is a fun fresh idea. The poor girls were named after... well, Disney princess by there collective mothers(who were sisters). As you can imagine, while the girls were growing up, every cliche was thrown at them from poison apples to lost slippers. They tried their best to distance themselves from the Disney character, however the other kids at school never let them forget! Thankfully, the girls had each other! The story begins as the enter the dreaded High school years! The girls must now pull together even more to make it through... as if High school wasn't bad enough, try surviving it with a name like Snow White! There are also several fun fairytale "ideas" throughout, such as kissing toads!!! This novel is a real charmer and worth a read for the young and the young at heart!! Well done new author Stacy Lynn Carrol! My daughter loved it also!